The U.S Food and Drug Administration has granted Expedited Access Pathway status to the Wearable Artificial Kidney (WAK) after the device performed successfully in its first U.S. clinical trial, at UW Medical Center in Seattle. Despite technical issues that halted the trial early, the FDA signaled its support for keeping research and development of the device fast-tracked as its components are redesigned. More than 600,000 Americans have end-stage kidney disease, whose annual mortality rate is 20 percent. Most of these patients are sustained by hemodialysis, a therapy that typically tethers them to a blood-cleansing device for 12-15 hours a week. (Click to expand.) Miniaturized components enable the battery-powered Wearable Artificial Kidney, worn as a tool belt, to perform hemodialysis. The WAK represents the one of the first innovations in dialysis technology in decades; its miniaturized components are worn like a tool belt and connected to patients via catheter. Ten patients were consented for the trial, conducted between October 2014 and April 2015, but only seven underwent treatment before the trial ended, said Dr. Jonathan Himmelfarb, a UW Medicine nephrologist and director of the Kidney Research Institute. With subjects who wore the device for the 24-hour protocol, however, the device performed admirably, Himmelfarb said. Dr. Victor Gura, the device’s inventor and a kidney specialist at UCLA and Cedars Sinai Medical Center in Los Angeles, was to present a study abstract today at the annual meeting of the American Society of Nephrology in San Diego. They will soon submit the results for publication in a peer-reviewed journal, Himmelfarb said. Dr. Matthew Rivara, a UW Medicine nephrologist and study investigator, said all seven patients expressed excitement to walk around hospital hallways while the WAK pumped. (Click to enlarge.) 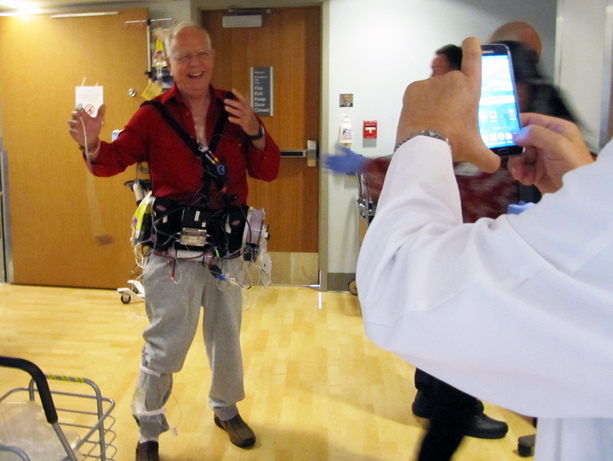 Chuck Lee, wearing the Wearable Artificial Kidney, happily stands in contrast to two less-portable dialysis options. “When patients perform hemodialysis at home, only a few options exist and they are large, heavy and stationary. The WAK represents the first truly portable hemodialysis machine, which could enhance patients’ quality of life and enable them to work and travel as they would otherwise,” Rivara said. Chuck Lee, 73, was the first U.S. test subject outfitted with the WAK. He has had diabetes for 40 years and has received thrice-weekly dialysis for just over two years. He was entirely upbeat about his 24 hours on the device. Because the WAK clears blood continuously, test subjects were also temporarily freed from burdensome restrictions on foodstuffs with salt, potassium and phosphorous. These elements accumulate in patients who undergo chronic dialysis. Lee delighted in recounting his menu during the trial: “a double order of macaroni and cheese for dinner … Cheetos all night long … orange juice and tomato juice. It was … so great,” he said. Other patients savored long-denied pizza and milkshakes, Rivara added. Even as Lee ate with relative abandon, the hourly blood draws during the trial showed his metabolic and other fluid counts stayed in a healthy range, said Lee’s wife, Sandee. (Click to enlarge.) From left, Drs. Larry Kessler, Victor Gura and Jonathan Himmelfarb, co-lead investigators of the WAK clinical trial at UW Medical Center. Before the U.S. trial, the WAK was designated for the FDA’s Innovation Pathway, which gave it frequent attention from regulators – “almost weekly phone calls for more than a year,” said Dr. Larry Kessler, a trial co-lead, with Gura and Himmelfarb. “Now, based on trial results and the technology itself, we’ve been OK’d for the Expedited Access Pathway. So when we submit materials, the FDA reviews them in real-time, in contrast with other projects that wait in a queue,” said Kessler, who formerly led the agency’s Office of Science and Engineering Laboratories. The pathway will come into play when the FDA reviews the device’s redesigned components.